Perry Oaks, Lockheed Martin, to serve as the new board chair for UAMMI (Utah Advanced Materials and Manufacturing Initiative) bringing extensive experience within the aerospace industry and Department of Defense. 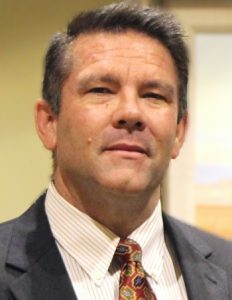 Kaysville, Utah – The Utah Advanced Materials and Manufacturing Initiative (UAMMI) board of directors has announced the selection of Perry Oaks as its new board chair. Mr. Oaks was voted in at the annual board meeting held on September 20th, 2017. UAMMI’s purpose is to accelerate the growth of the advanced materials industry in Utah by connecting industry with academic research, enhancing the supply chain and assisting in workforce development. Along with its board chair, UAMMI is governed by a Board of Directors consisting of members from industry, government, education and research communities. Oaks will follow Darin Friees, former Director of Engineering for Albany Engineered Composites, who recently relocated out of state. Mr. Oaks has an extensive background and experience within the aerospace industry and the Department of Defense. He currently serves as Utah’s Senior Manager of Government Affairs for Lockheed Martin. Prior to that, he had a distinguished 27-year career in the Air Force, retiring as a Colonel after his final assignment at Hill Air Force Base as Chief of the Munitions Division there, which procured and sustained essential wartime munitions for the entire Department of Defense. Mr. Oaks has held many leadership ranks at various air force bases. Among these, he commanded a maintenance group in Iraq as well as maintenance squadrons supporting A-10, F-15, and F-16 aircraft. “I am very pleased with the selection of Perry as the new UAMMI board chair,” said Jeff Edwards, Executive Director for UAMMI. “There was unanimous support from the board and we feel that Perry brings unique insight to the aerospace and defense community along with a great blend of valuable industry experience and leadership to the position,” added Mr. Edwards. “I am honored to serve as the UAMMI board chair”, said Perry Oaks. “While we have many capable board members, whose service is much appreciated, I am happy to serve in this position and contribute where I can. I will do my best to lead the board in their efforts to grow this vibrant industry in Utah”, added Oaks. Utah has a long history of aerospace advancements with many of the materials and processes used in advanced manufacturing around the world have been developed here in Utah. Today, the advanced materials and manufacturing industry in Utah comprises over 100 companies and employees over 10,000 skilled workers developing advanced materials for a wide variety of aerospace components, medical devices, industrial products, recreational equipment and more. The goal of UAMMI is to maintain Utah’s leadership in this key global industry. Founded in 2014, and initially funded by the state of Utah, the Utah Advanced Materials and Manufacturing Initiative (UAMMI) brings together public, private, community, industry and education partners to assure growth and sustainability of Utah’s advanced materials and manufacturing industry and maintain Utah’s leadership in this key global industry.